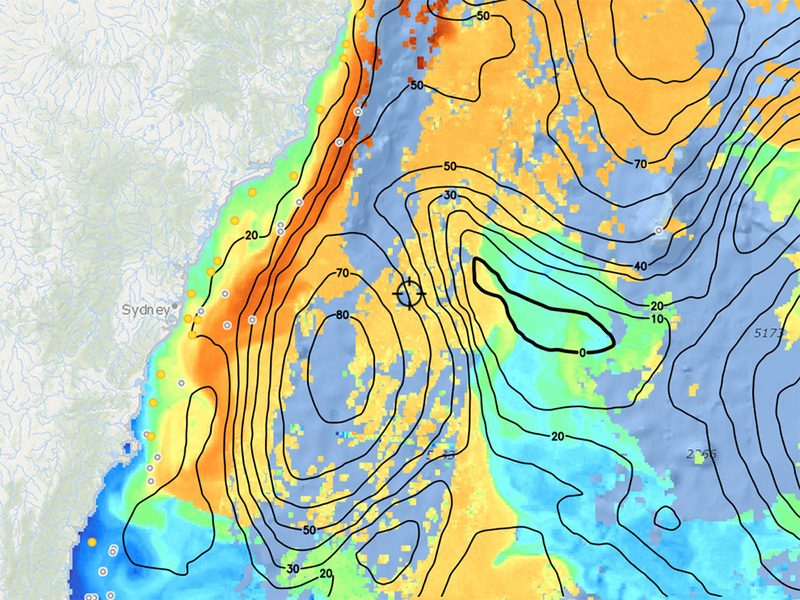 How to use altimetry maps and sea surface height data to find more fish.. In this AVHRR SST image of the central Gulf of Mexico, we can see the Gulf Loop Current (lower left of screen) with the altimetry overlay. You can see how the sea surface height of the warm current is higher than surrounding waters. 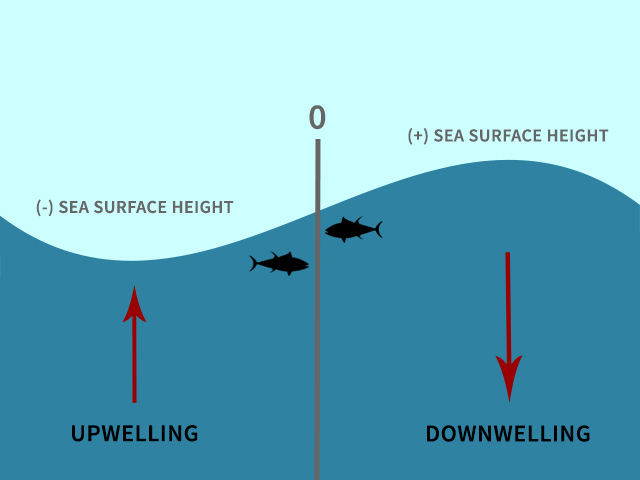 Though simplified, this illustration shows the basic relationship between sea surface height and upwellings and downwellings. Another SST image -- this time off Syndey, Australia. Notice how the altimetry relates to the East Austrailian Current running down the coast and the low area of upwelling NE of the high. Note that because of the Coriolis effect, currents will flow counter-clockwise around such highs in the Southern Hemisphere. This image shows the Gulf Stream off of the Carolinas. You can see how the warmer waters of the stream are higher than the cooler nearshore waters. This MODIS Chlorophyll image shows the Gulf Loop Current. Now, the same image with altimetry-derived currents overlay shows how currents flow around highs (clockwise) in the Northern Hemisphere. This MODIS Chlorophyll image shows an area of convergence (high) south of Japan. 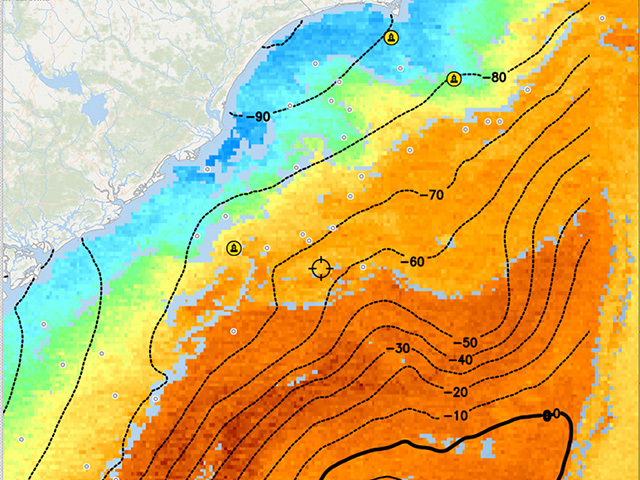 FishTrack's altimetry overlays offer a valuable tool when planning an offshore trip. Relatively small changes in sea level can ultimately influence the feeding patterns of big-game fish, and modern satellites orbiting the Earth can measure ocean surface height with uncanny precision. By studying altimetry data in conjunction with sea surface temperature, chlorophyll and bottom structure, you'll be able to dial in hot spots, burn less fuel and catch more fish. Below are some of the most frequently asked questions regarding altimetry. What is the significance of altimetry? The surface of the ocean isn’t flat -- there are high spots and low spots. Altimetry imagery indicates the ocean surface height in relation to mean sea level in centimeters. By studying the latest altimetry imagery you can locate areas of upwelling and downwelling and the location of ocean current features and eddies. Where does the altimetry data come from? There are various satellites equipped with instruments called altimeters. These instruments are incredibly accurate and measure the height of the ocean’s surface from space to within a few centimeters. How often is FishTrack’s altimetry imagery updated? The model is updated once a day. Why aren’t altimetry readings affected by cloud cover like the SST and Chlorophyll images? The altimeter works by sending out a microwave pulse, bouncing it off the ocean’s surface and measuring the return signal, so cloud-cover doesn’t affect altimetry measurements in the same way it affects other types of satellite imagery. An upwelling is a phenomena where water from the deep ocean rises to the surface. This cold, deep ocean water is densely packed with nutrients and when it rises to the surface and is hit by sunlight, microscopic plants (phytoplankton) and animals (zooplankton) are able to grow quickly. Squid and baitfish feed on these microscopic animals, and in-turn attract larger pelagic species. 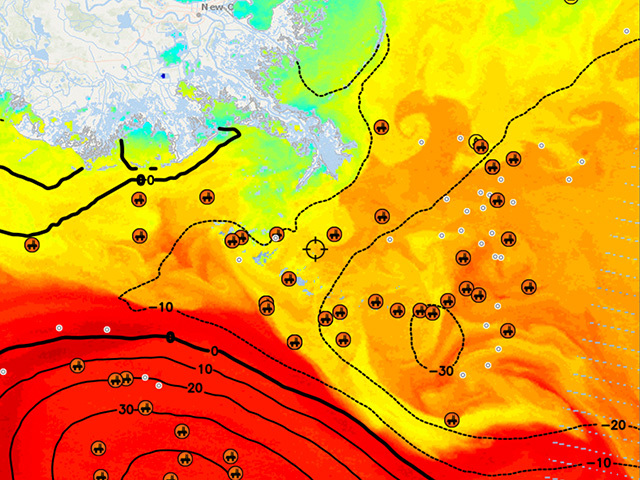 How do you find areas of upwelling on the SSH map? 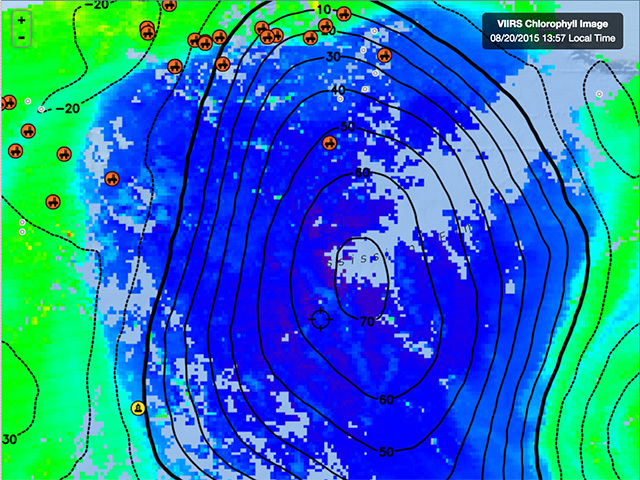 Upwellings can be identified by areas on the SSH (sea surface height) chart that are lower than surrounding areas. It’s a bit counter-intuitive, but basically water in these “low spots” is rising to the surface to achieve equilibrium. Where in general are the best areas to fish on the SSH map? Generally speaking the best areas to fish are in the intermediate zones between areas of upwelling and areas of convergence. These neutral areas -- between the highs and away from the center of the low -- is where the food chain will have time to develop. How can altimetry maps be used in conjunction with SST and Chlorophyll imagery? In many cases you will be able to see upwellings and warm-core eddies with both satellite and altimetry imagery. 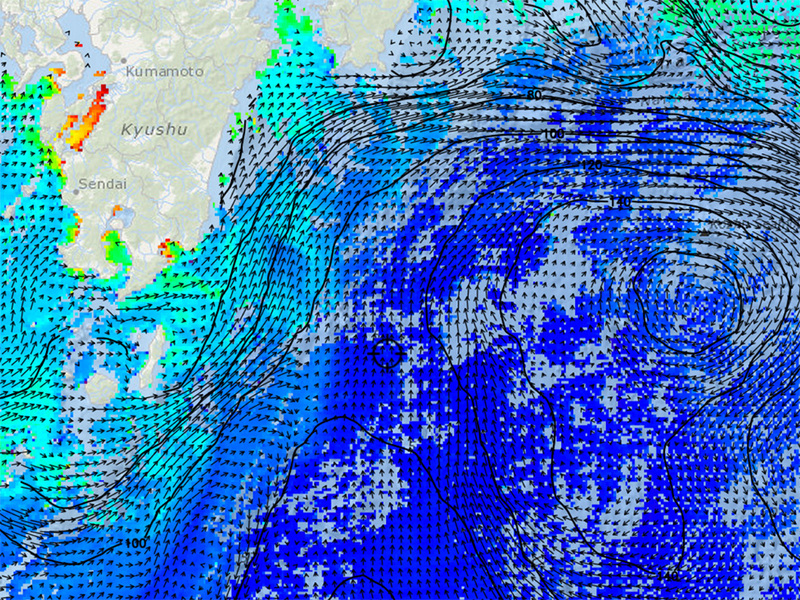 How can altimetry overlays be used as a substitute for SST maps when there is cloud-cover? Altimetry data overlays won’t line up precisely with the satellite imagery, but you will see that the data sources will correspond and can be used when there is no recent satellite imagery to go off of. It’s certainly better than driving around blind, particularly when you are aware of the limitations of the data. What are some other tips on reading the Sea Surface Height maps regarding currents and eddies? The real secret -- if there is one -- is to understand how the altimetry image you see is created and how that will affect the data’s accuracy. Once you understand the data sources’ limitations you will be able to understand when and how to use it properly.